The Walla Walla Union-Bulletin has recently printed several letters to the editor from citizens supporting the removal of the Lower Snake River dams. A new environmental group at Whitman College has been formed for the same purpose. The arguments they use to support dam removal are flawed. The notion that breaching the Snake River dams would save taxpayer money, while increasing "recreation" money and by reference exceed the current benefits of hydropower and barging flies in the face of every objective academic study done by actual experts. Dam-breaching proponents claim investments in wind generating capacity have made hydropower redundant. Perhaps they are referring to the Northwest Power & Conservation Council's 2014 report that states wind energy added 1,906 MW of new generating capacity. What they failed to mention is that same report lists hydropower as providing 62,336 MW, or 53 percent of our total generating capacity. Additionally, hydropower provides critical peaking capacity to the Northwest, to meet high energy demands almost immediately. Wind energy simply can't respond in that way. The Snake River dams and the carbon-free electricity they produce are a critical part of our regional energy portfolio. The Columbia Snake River System is the top wheat export gateway in the nation. 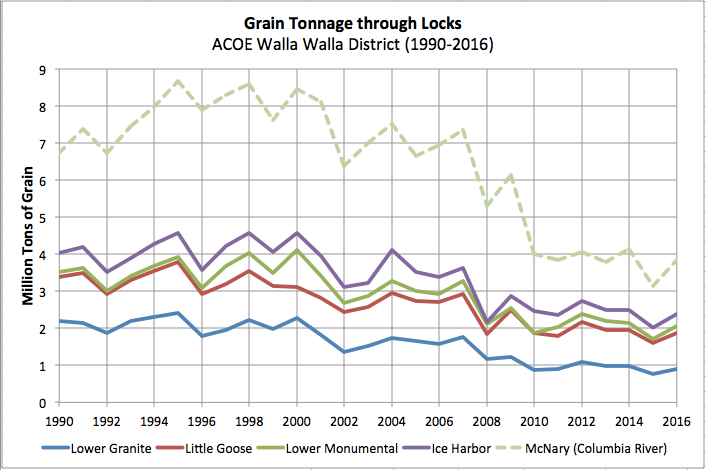 Of the wheat moving by barge down the river for export, 54 percent moves through one or more of the four Lower Snake River dams. Barging on the Columbia Snake River System moves 9 million tons of cargo valued at $3 billion each year. Our river system allows communities in Eastern Washington and beyond to export their goods to countries throughout the world, and keeps our farmers and others competitive in the global marketplace. While dam-breaching proponents make their case in environmental terms, no true environmentalist would advocate removing barging as a transport option. One barge tow carries the equivalent of 538 trucks worth of tonnage. Barging is the safest, most efficient and most environmentally friendly method of cargo transport available today. A barge can move one ton of wheat 576 miles on one gallon of fuel. Barging has lower exhaust emissions than rail or truck. Rhetoric is no match for facts. The inland river system is a robust multiuse system that supports hydropower, navigation and recreation, balanced with fish and wildlife needs. At a time when we have more demand than ever on our surface transportation systems, our region is the envy of other areas that do not have barging, and must rely on trucking and rail. Most in the region are excited to celebrate historic collaborative efforts that are yielding record returns for our iconic salmon runs. We encourage those who care about fish, energy, trade and recreation to join in that collaboration. Ron Dunning is the current president of the Port of Walla Walla Commission. He has served on the Port Commission since 2010. He is the owner of Dunning Irrigation, co-owner of Touchet Seed & Energy, and 51 East Main, a downtown Walla Walla commercial property.